Welcome to Canopymart StarShade Canopy Selection. 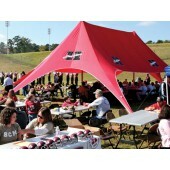 StarShade Party Tents are not your average outdoor shelter. 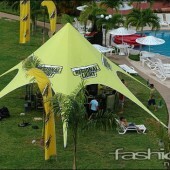 These unique star-shaped tents provide large coverage with an elegant design suitable for any kind of outdoor event- be it a wedding reception, marketing exhibition, or art festival! StarShade Party Tents feature six elegant arhces that give added visual appeal and set up quickly in less than 20 minutes. 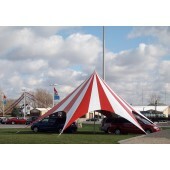 StarShade Party Tents fold down into 3 carry bags that fit in the trunk of most standard vehicles. StarShade 800 covers 800 sq. ft. and the StarShade 400 covers 400 sq. ft. though the actual footprint of these tents is larger than the covered area. Requires 30 inch ground spikes to support the tension structure. - We do Custom Screen-Printed Graphics. - NEW! Full-Coverage Digital Printing Available. 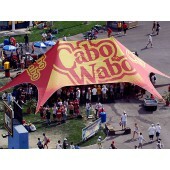 Enjoy our Free Shipping offer in the Continental United States for all of our Star Shade Canopies.